Yes. It held two test tubes. There was a pump on the top and it spun around. 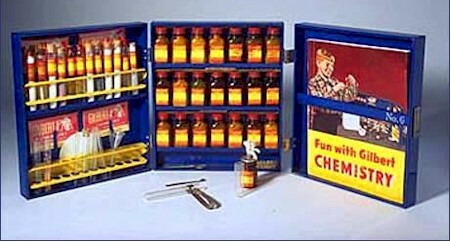 Mine came with a lot of chemicals, test tubes, scale, centrifuge, alcohol burner, stand, beaker, and asbestos pad. My sister had one of these, or something similar, and one time, when our father was threatening her with a spanking, held up a liquid-filled test tube and said "One more step and we'll all go together........."
I had a couple of these. They came in different sizes, from simple / beginner to more complex. I enjoyed mine. Sulphur makes excellent stink bombs.